Many people who come to Oaxaca want to know more about the wonderful unique food from this region especially the variety of "mole" sauces, the banana leaf-wrapped tamales and the vast array of soups, all using typical Oaxacan ingredients. Experienced chef and owner of La Olla, Pilar Cabrera, offers you the opportunity to learn, hands-on, the complex cuisine of Oaxaca. Pilar´s cooking classes, La Casa de Los Sabores (House of Flavors), are set in a spacious, newly remodeled traditionally styled Oaxacan kitchen. In a warm and inviting atmosphere, you will learn to create the traditional Oaxacan dishes of your choice, made famous throughout Mexico and spreading worldwide. Shared and private classes include an explanation about the ingredients, a tour to the local market, hand-made meal preparation, mezcal tasting and, of course, the five course meal you prepared which you can ejoy at the end of the class. After your class, you will enjoy the 5-course meal you yourself have prepared. 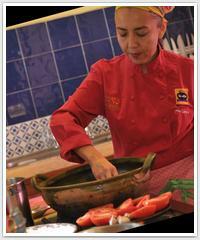 Pilar will teach you her family´s generations-old cooking secrets so you can learn and enjoy a Oaxacan culinary legacy. We offer group cooking classes for 4 to 10 people, as well as private classes for culinary students and chefs.